Recent release “Post-Traumatic Stress Disorder (PTSD) Awareness” from Page Publishing author Dr. Ann Brown Ph.D. is intended primarily for use by chaplains, pastors and faith-based counselors, police officers, and the spouses of law enforcement police officers who have the responsibility for working or dealing with those suffering or will suffer from traumatic stress and post-traumatic stress disorder. Dr. Ann Brown Ph.D., who holds a Ph.D. in pastoral counseling and psychology and has published thirty-seven books, has completed her new book “Post-Traumatic Stress Disorder (PTSD) Awareness”: an invaluable resource intended to help and encourage those already involved in a program for prevention of PTSD and to give faith-based insight about the needs of those who suffer from PTSD. This manual exhibits a biblical view about what God tells us about care to those in need with a deeper understanding. Dr. Brown Ph.D. shares, “How often have you heard the term ‘PTSD’ or Post Traumatic Stress Disorder? We know that it exists but do you really know what it means? Many of us suffer from PTSD and yet, have no idea what it is, how to recognize it or it’s triggers and what’s worse, we have no idea what to do about it. Many of us suffer from it and don’t realize it until we are embroiled into fits of unexpected anger, depression and even worse, suicide or suicidal tenancies. Not to mention, domestic violence, divorces, and child abuse that are direct side effects of severe PTSD. 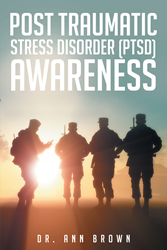 Published by New York City-based Page Publishing, Dr. Ann Brown Ph.D.’s informative guide is a helpful resource for those hoping to help others suffering the debilitating effects of Post-Traumatic Stress Disorder. Readers who wish to experience this faith-based work can purchase “Post-Traumatic Stress Disorder (PTSD) Awareness” at bookstores everywhere, or online at the Apple iTunes store, Kobo, Amazon, Google Play or Barnes and Noble. Page Publishing is a traditional New York-based full-service publishing house that handles all the intricacies involved in publishing its authors’ books, including distribution in the world’s largest retail outlets and royalty generation. Page Publishing knows that authors need to be free to create - not bogged down with logistics like eBook conversion, establishing wholesale accounts, insurance, shipping, taxes, and the like. Its roster of accomplished authors and publishing professionals can leave behind these complex and time-consuming issues, and focus on their passion: writing and creating. Learn more at http://www.pagepublishing.com.